Mountain Re-Source Center empowers community organizations to bring people and products together to enhance the well-being of under-resourced families and children. We envision a network of manufacturing and retail donors that partner with community organizations and public agencies to distribute surplus products creating “community.” Therefore, neighbors help neighbors, homes and lives are rebuilt, and congregations, organizations and public agencies all work together to help those in need. 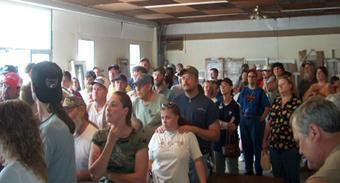 Families in Appalachia wait for the doors to open for a distribution of building materials. 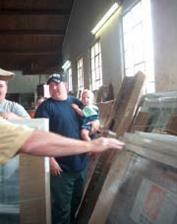 Building materials are distributed through nonprofit community organizations. Family care items are distributed to faith-based and social organizations which distribute to their communities. 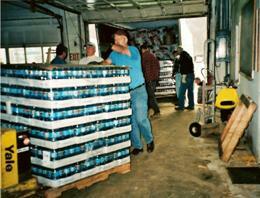 Herb Miller helps volunteers unload a truck at an MRC partner warehouse.